One of the world’s most enchanting countries, Finland is full of beautiful lakes and lush forests. Firm believers that travel has so much to offer and is worth every penny, Neena and Aumita have seen plenty of the world. Yet they’re constantly on the lookout for new experiences. Having always wanted to see the Northern Lights, the duo took off for this mystical land in eastern Scandinavia. Aumita relays their adventure. Neena and I love travelling and learning about new cultures and traditions. We were very keen on seeing the Northern Lights, so we joined a holiday group to tour Finland along with four other people. Off we went, the six of us, to our winter holiday destination. What a welcome it was in the Finnish capital of Helsinki – five feet of snow! The roofs of all the houses and buildings were covered in nearly two feet of the white powder, and every inch the whole country seemed white. It should come as no surprise, then, that this is one of the best places for winter activities. It truly was a winter wonderland. Life seemed to go on quite normally in spite of the endless snow. Finland is very tourist-friendly, especially for people interested in skiing or snowboarding. We flew to Ivalo, the highest-altitude airport in Finland, where we stayed in an igloo. 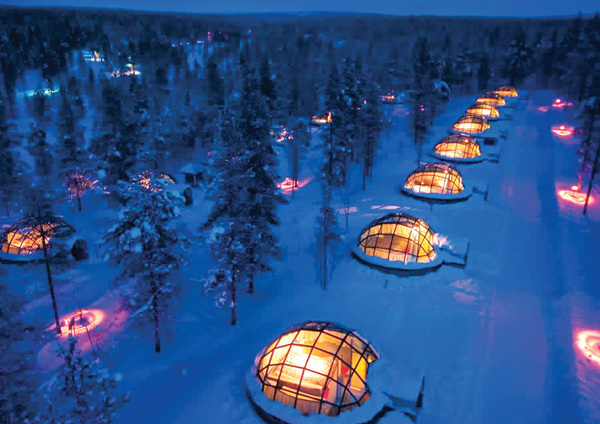 You may have seen pictures of the igloo village in northern Finland, with structures made of glass and snow. It was so magical, as if right out of a movie. Nomadic as it sounds, staying in the igloo was very comfortable (they came equipped with toilets and heating, so it was very comfortable). We lay on our beds, gazing at the unbelievable view of the sky – what a beautiful experience! Though not lucky enough to see the Aurora Borealis there, we didn’t lose hope, since there were still close to five days left. Instead, we rode a sled pulled by a bunch of friendly huskies. When the dogs get tired and thirsty, they dig into the snow to quench their thirst; Finland’s many lakes and rivers are all frozen over during the winter Continuing our search for the lights, we drove 300 kilometres to Rovaniemi, where we stayed at the Hotel Santa Claus. This time, we got lucky and caught a glimpse of what we were chasing. 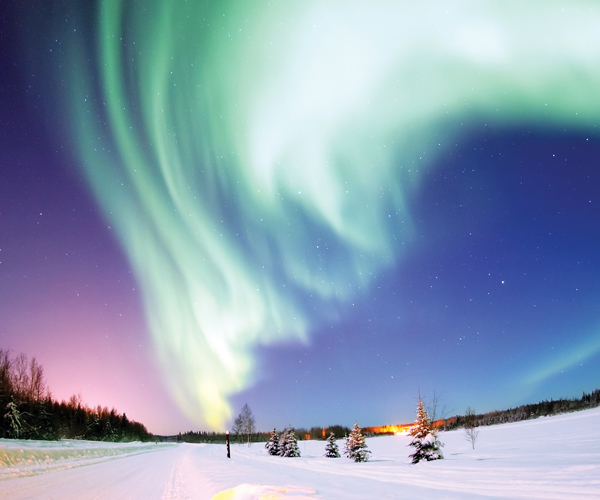 The Northern Lights were a sight for sore eyes. White fairies danced amongst the mystical green lights, the trees in the background laden with pure, white snow and the sky littered with the canvas of nature. And to think this phenomenon is completely natural! It beats any laser or light show you could ever imagine. Having got what we came for, we set out to experience more of the country. Our adventure would be incomplete without a sled ride featuring what Finland is famous for: reindeer! The males had no antlers, as they shed them during the winter; females shed their horns in the spring. These shed horns are used to make a variety of useful and decorative objects like candle stands, keychains, and bottlep openers. From Helsinki, you can visit a number of other places, such as the Estonian capital of Tallinn. This Baltic state is a scenic locale that was once part of Russia. It is a beautiful medieval country. 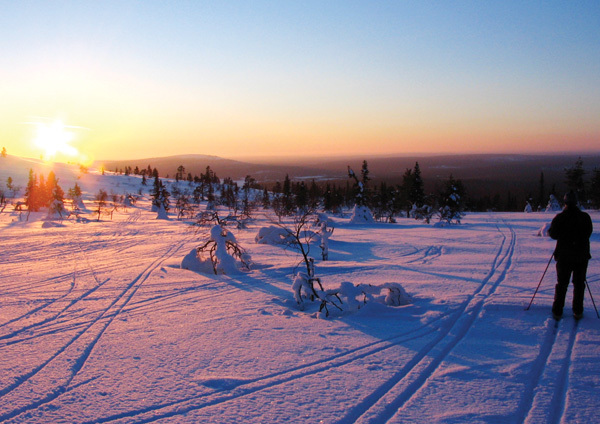 Lapland is another gorgeous place to visit during the winter months, though it does get extremely cold. Knowing the temperature drops well below zero, we went prepared with plenty of warm clothes. If you plan on going, definitely bring warm clothing that you can layer, as well as leather boots. Equipped with the right winter gear, you’ll be sure to enjoy the snow. We got to visit Santa’s Village, a convincing fantasy experience where we met and sang songs with the big guy himself. 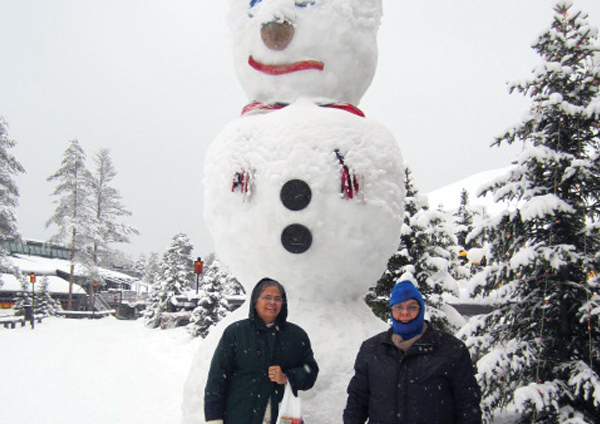 Neena and I built a big snowman, which made us feel young again. At our age, a trip with such childlike wonder was more than we could have asked for.